Barnsley Youth Choir, established in 2009, is a registered charity run by volunteers that seeks to provide outstanding opportunities for young people who live in Barnsley and has developed a reputation for excellence. The choir is ranked 5th in the World Rankings in its category and has won 8 first prizes in some of the biggest international competitions in the world. Barnsley Youth Choir was presented with the Queen’s Award for Voluntary Service (MBE) in January 2018, the highest award given to volunteer groups across the UK and this was in recognition to the outstanding support and dedication shown by the volunteers who run the choir. BYC is highly inclusive and consists of over 400 singers. It has released 2 albums, performed on TV and Radio and has raised significant amounts of money for local charities. 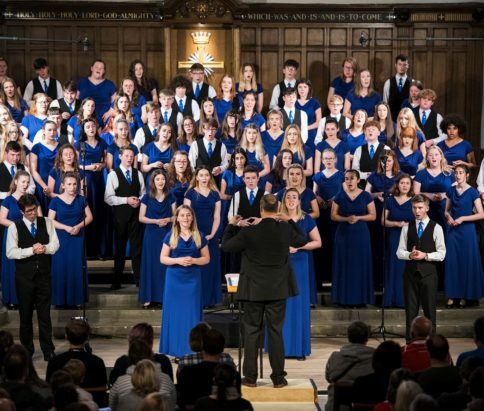 The choir has had the opportunity to work with some of the world’s finest singer, conductors and choirs in this country and abroad, and has appeared in outstanding international venues. It is unusual in that it maintains a wide and diverse repertoire including Popular, Gospel, Spiritual, Folk and more Classical genres, and audiences appreciate the variety of music performed in concerts. BYC prides itself on providing exceptional experiences for young people and engenders a sense of aspiration. Being a member helps young people to develop skills and qualities that will support them throughout their lives.